The Audit Bureau of Circulation’s (ABC) report released on May 8 says Hindi publications witnessed the highest growth with a CAGR (compound annual growth rate) of 8.76 per cent between 2006 and 2016. Telugu was the second fastest growing with a CAGR of 8.28 per cent and English stood at No. 5, clocking a 2.87 per cent CAGR. The results were presented by Shashi Sinha, CEO, IPG Mediabrands and a member of ABC at an event in Mumbai. Others present at the event were I Venkat, Director, Eenadu and Chairman, ABC; Devendra Darda, MD, Lokmat Samachar; Sandip Tarkas, former President, Customer Strategy, Future Retail Ltd., Girish Agarwal, Dainik Bhaskar and H Masani, General Secretary, ABC. The report suggested newspapers are thinking along the lines of greater local news coverage in order to cater to every segment of consumers as well as readers. ABC certifies a total of 967 publications, of which 910 are daily/ weekly newspapers and 57 are magazines. Even among the top 10 publications, Dainik Jagran and Dainik Bhaskar stood at No. 1 and No. 2 spots with average qualifying sales figures (July-December 2016) of 3.921 million and 3.813 million, respectively. The Times of India was the only English publication to be listed in the top 10 with average qualifying sales of 3.184 million, at No. 3. Next in the list were Amar Ujala (Hindi), Hindustan (Hindi), Malayala Manorama (Malayalam), Eenadu (Telugu), Rajasthan Patrika (Hindi), Daily Thanthi (Tamil) and Mathrubhumi (Malayalam). 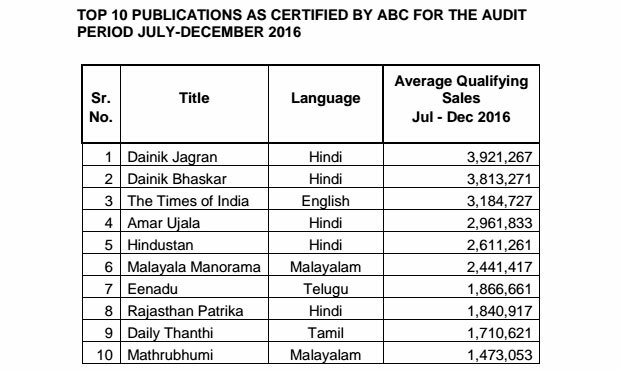 ABC-India releases two reports every year, certifying circulation figures of member publications. The trend of certified circulation figures by ABC show that the print medium (member publications of ABC) is thriving, growing and expanding in India in spite of stiff competition from all other mediums -- television, radio and digital. Publishers voluntarily enrol themselves as members of ABC to get their circulation figures audited. Founded in 1948, ABC is also the founder member of International Federation of Audit Bureaux of Certification (IFABC) since 1963. In the last 10 years, about 2.37 crore copies have been added with an increase of 251 publishing centres in India. The latest report also mentions that the average copies per day in 2006 were 3.91 crore, which has grown to 6.28 crore in 2016. The number of publishing centres has grown from 659 to 910 in the same period. 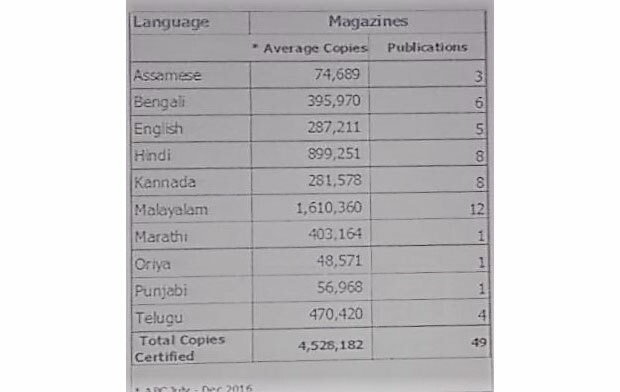 Speaking about languages, Malayalam led the flock among the magazines with 1.610 million copies, out of the total 4.528 million copies. Hindi followed with 899 million and Telugu stood third with 470 million average copies. Considering the zone-wise growth, north zone has seen the maximum growth with 7.83 per cent CAGR, closely followed by south zone with 4.95 per cent CAGR. West and east zones clocked CAGRs of 2.81 per cent and 2.63 per cent, respectively. In India, regional language newspapers have largely contributed to the growth. Giving a sneak peek into the international perspective on the growth of the Indian print industry, the report established how India is the only country with positive growth numbers in print. The WAN IFRA report numbers of 2016 established that when compared to Australia (growth of -6 per cent), France (-3 per cent), Germany (-3 per cent), Japan (-2 per cent), the UK (-12 per cent) and the USA (-2 per cent), India is the only one showing a growth of 12 per cent in 2015.